The best young players learn to live with the lofty, often inaccurate comparisons which are made between themselves and former greats. But the very best players become the next point of comparison. Kai Havertz could be one of those players. Imagine being a young German midfielder dubbed the next Michael Ballack, by none other than the Bundesliga’s own website. It would be like the official Premier League website announcing that James Ward-Prowse is the next David Beckham, or that Alfie Mawson is the new John Terry. This what happened to Havertz, a midfielder who only recently turned 18 years old and also happens to play for one of Ballack’s former clubs, Bayer Leverkusen. He became Die Werkself’s youngest ever goalscorer last season when he scored his first Bundesliga goal against Wolfsburg in a 3-3 draw in April. The strike prompted the article on the Bundesliga website, and hints that it might be difficult to disagree with the comparison no matter how exalted it might seem. It’s not just this goal which has led to such high praise. His performances last season were carefully managed but whether he appeared in the starting lineup, or from the bench, he showed great promise. He provided a flicker of light in a disappointing season for Leverkusen who sacked their manager of almost three years, Roger Schmidt, after a 6-2 drubbing at the hands of Borussia Dortmund in March. The club have been regular qualifiers for European competition from the Bundesliga, and they’d participated in the Champions League for five of the last six seasons, but this season they finished a lowly 12th. Something both player and club will look to improve on next season. 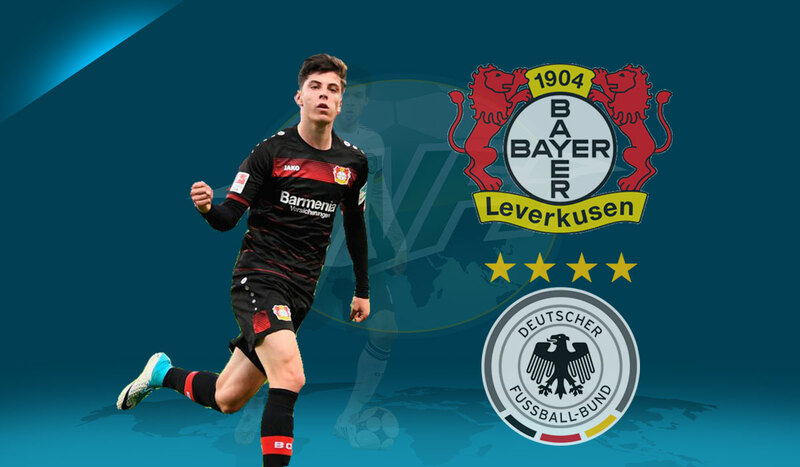 At 6ft 1” (186cm) Havertz is a considerable presence in the middle of the park, and this is where the comparisons with the 6ft 2” (188cm) Ballack begin. His height means he can challenge aerially when needed, and also allows him to stride through midfield past opposition players. His 3.7 aerial duels won per game (5.5 per 90’) put him among the best in the Bundesliga for this particular statistic. Good going for a midfielder. In terms of technical ability he boasts a good first touch and an eye for a pass. While his execution can occasionally lack tidiness, there’s no doubt that he has the ability to find teammates and make the right decision in tight spaces. His decision making will become more refined as he ages, and there have already been signs of improvement even though his passing accuracy for the 2016/17 season clocked in at a disappointing 74%. In the attacking positions he often finds himself in it can be difficult to find a teammate all of the time, but he’ll be looking to improve his accuracy in this regard. Again, there’s no doubt he has the technique, awareness and passing ability to do so. Some of this untidiness will have been affected by Leverkusen’s poor showing last season and should the club bounce back next year, displaying more quality throughout the pitch, Havertz could shine. His vision and ability on the ball led to five assists during the last campaign, and drew comparisons with Mesut Özil in another bundesliga.com article, but he has much more to his game than the Arsenal playmaker. His combination of work rate and movement can make it seem like a forcefield of energy surrounds his actions in both defence and attack, and he’s always available to help out a team mate if he’s somewhere in their vicinity. This all-round ability means he’s been able to take up a wide range of positions. Versatility is always handy for a young player looking for game time, as he can fill numerous slots when needed rather than fighting an established first team player in one specific role. He’s played on either flank in midfield, as a central midfielder, and also behind the striker in an attacking midfield position, performing his duties in variations of 4-4-2/4-2-2 and 4-2-3-1 formations. He has a good understanding of the game and awareness of those around him, and his ability with both feet means he’s not afraid to spray passes around from any position with either side. The left foot will be a weapon once it’s honed in front of goal, with the right as reliable back up, and an ability to time runs into the box at the right time could see double figures for goals sooner rather than later. As if to kickstart the summer transfer rumours, Havertz scored two goals in the final game of the season as he put in a man of the match performance against Hertha Berlin. “You could see what our qualities are,” he said after the game. The game gave the club something to build on for next term, but it also showcased the talents of Havertz to any potential suitors preparing their summer transfer business. And the Bundesliga could be a hive of transfer activity this summer. Within the league itself Bayern Munich look to cherrypick the best talent to maintain their dominance, while clubs from other European nations circle around the abundance of football talent emerging from Germany in recent years. Havertz is one of the youngest in a long list of names which have been linked with moves this summer, but he’s still relatively under the radar compared to the likes of Leipzig’s Naby Keita and Timo Werner, and Schalke’s Max Meyer. If he doesn’t move clubs then he should play a more prominent role for Leverkusen next season, and should he stay fit he will start more often than not. This will only serve to further alert onlookers from elsewhere on the continent to a player who will be forcing his way through a myriad of talent into the German national team in years to come. Whether he’s the new Ballack, Özil, or some other high profile German footballer, in the future the Bundesliga website may be preaching about the next Kai Havertz.